WASHINGTON (AP) — Former Trump campaign foreign policy adviser George Papadopoulos was scheduled to report to prison on Monday after a federal judge rejected his last-minute bid to delay his two-week sentence. Papadopoulos, a Chicago native, was listed on the Bureau of Prisons website on Monday morning as "currently in transit." 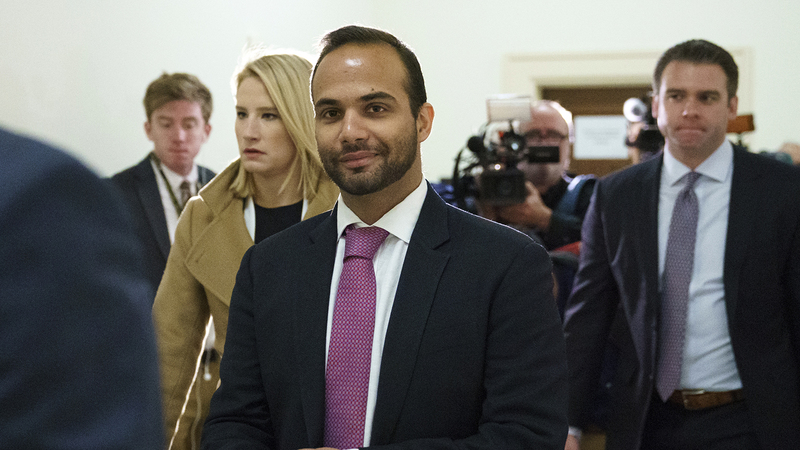 Papadopoulos was sentenced in September for lying to the FBI in the Russia investigation. He had sought a postponement of his prison term until an appeals court had ruled in a separate case challenging the constitutionality of special counsel Robert Mueller's appointment. But in a 13-page opinion Sunday, U.S. District Court Judge Randolph Moss said Papadopoulos had waited too long to contest his sentence. Moss noted that Papadopoulos had agreed not to appeal in most circumstances as part of his plea agreement, and the judge said the challenge to Mueller's appointment was unlikely to be successful in the U.S. Court of Appeals for the District of Columbia Circuit. Four federal judges have upheld Mueller's appointment as proper. "The prospect that the D.C. Circuit will reach a contrary conclusion is remote," Moss wrote. Papadopoulos had filed an initial motion on Nov. 16, nearly two months after the deadline for appealing his conviction or sentence. He followed up with a request to delay his sentence pending that motion on Nov. 21, the day before Thanksgiving. "Papadopoulos waited until the eleventh hour to seek relief; indeed, he did not file his second motion — the stay request — until the last business day before he was scheduled to surrender to serve his sentence," Moss' order states. "He has only his own delay to blame." Papadopoulos' wife, Simona Mangiante, tweeted last week that Papadopoulos had been assigned to a prison in Wisconsin. The only facility in the state is a medium-security prison, with an adjacent minimum-security camp, in the village of Oxford, about an hour's drive north of Madison. Responding to the judge's order, Papadopoulos wrote in a tweet on Sunday that he looked forward to telling the full story behind his case. In recent months, he has spent many nights posting on Twitter, as has his wife, venting anger about the FBI and insisting he was framed by the government. He also has offered to testify before the Senate's intelligence committee, which is investigating Russian interference in the 2016 election, if he's granted immunity or other conditions. "The truth will all be out. Not even a prison sentence can stop that momentum," Papadopoulos tweeted. "Looking forward to testifying publicly shortly after. The wool isn't going to be pulled over America's eyes forever." Papadopoulos pleaded guilty last year to lying to federal agents about his interactions with Russian intermediaries during the 2016 presidential campaign. He also forfeited most of his rights to contest his conviction. His lawyer argued that the appellate case could constitute new evidence that could allow him to mount a challenge. That case was brought by a witness refusing to comply with a Mueller grand jury subpoena. Papadopoulos' sentence, issued by Moss on Sept. 7, was far less than the maximum six-month sentence sought by the government but more than the probation that Papadopoulos and his lawyers had asked for. Moss at the time noted that many similar cases resulted in probation but said he imposed a sentence of incarceration partly to send a message to the public that people can't lie to the FBI. Papadopoulos, the first campaign aide sentenced in Mueller's investigation, triggered the initial Russia investigation two years ago. Memos written by House Republicans and Democrats and now declassified show that information about Papadopoulos' contacts with Russian intermediaries set in motion the FBI's counterintelligence investigation in July 2016 into potential coordination between Russia and the Trump campaign. That probe was later taken over by Mueller. The White House has said Papadopoulos was a low-level volunteer on the campaign.